All rugs of the Mischioff Collection are made of high-quality natural materials and are hand-made in the traditional way and under fair conditions. The perfect translation of the complex designs in our manufactory in Nepal is a big challenge. The Mischioff design team creates full-size design templates, whereupon skilled weavers carefully realize the complex design - knot by knot - in several months. After a labour-intensive finishing, the rugs are washed in an environmentally friendly manner and get prepared for the export after a stringent quality control. The fantastic world of Mischioff rugs stems from the creativity of the designers Dani and Sascha Misio, who create all collections and designs. The brothers, who draw their inspiration from modern art, contemporary design and current fashion trends, are leading figures in the Swiss and international design world. 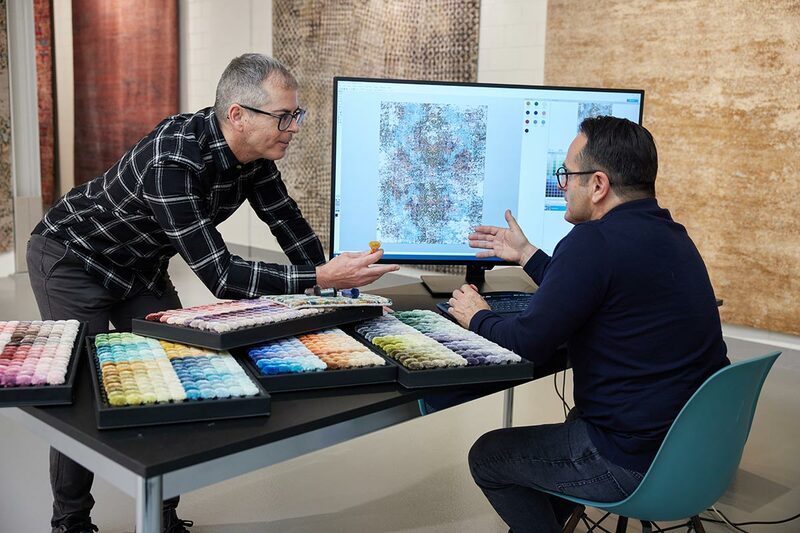 With great passion, the brothers create extraordinary and unique carpet designs and work continuously on the further development of the Mischioff carpet collections. Thanks to their creative ideas, they are considered to be renowned representatives of the international design scene. The experience gained from three generations of carpet production ensures the high-quality implementation of their ideas. The complex carpet designs are created entirely by hand in a modern manufactory in Nepal, according to the design specifications. The constant contact with the rug manufacturing centre ensures the perfect realization of the designs and the final product's high quality. Skilled workers create full-size drawings from the design templates, which the weavers then realise, knot by knot. The preparatory work, such as spinning and dyeing the wool, is performed by hand directly in the manufactories. The knotting process takes several months, after which the rug is sheared and washed locally in an environmentally friendly manner. Sustainability is an important aspect for Mischioff in all respects - such as production, design, quality, ecology or fair trade principles. For Mischioff the familial contact with the manufactories is a matter of course and important requirement for the excellent implementation of the intricate designs. Regular visits of the different production sites by Dani Misio support these good relations. 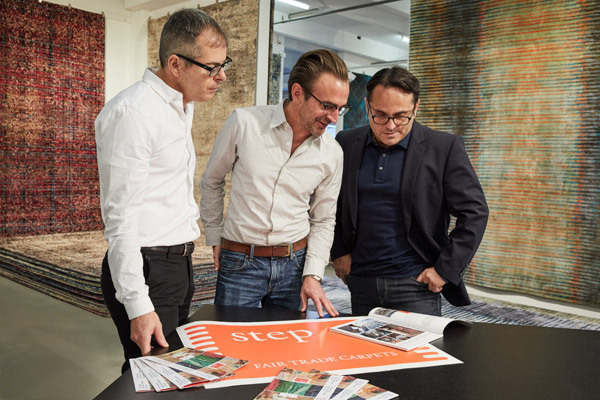 As a long-term partner of Label STEP, Mischioff is commited to fair trade with handmade rugs. Mischioff advocates good working conditions and environmentally friendly production methods. In addition, the company pays fair purchasing prices ensuring fair wages, supports local day care centres and takes a zero-tolerance approach to abusive child labour. The standards of fair trade apply to all our collections - so every Mischioff rug is a true fair-trade product. Rug manufacturing in nepal, the roof of the world. The raw wool get prepared and carded by hand. The wool and silk are spun by hand to get the knotting yarn. All materials are environmentally friendly and gently washed and dyed. The rugs are knotted on the looms in traditional way - knot by knot. The rugs of the Mischioff Collection are knotted in the Tibetan knotting technique, which is very strong and easy-care. After the knotting process is finished, the carpets are carefully checked and finished. The Mischioff brand band serves as a seal for high-quality carpets. Finally, the carpets are environmentally friendly washed before they are prepared for shipping. The carpets from the Mischioff manufactory in Kathmandu / Nepal take their journey to the customers worldwide. The standards of fair trade apply to the entire product range of Mischioff rugs. Independent Label STEP inspectors regularly check that our productions facilities comply with these standards. The ARTE documentation "Fair trading - Carpets from Nepal" with the german actor Hannes Jaennicke offers interesting insights about Label STEP and the carpet production in Nepal. The following short video (five minutes) provides a short overview about the important work of the independent fair-trade organisation in Nepal (Video in german language). Get all information about the company and our design work.